Dolly Parton is probably the most famous female country singer throughout the world, as well as an American cultural icon. She is instantly recognized for her distinctive tremulous voice, blonde wigs, large bosom, and sparkly sequin dresses. From her beginnings as a country singer, songwriter, and instrumentalist in the 1960s, she has expanded her career into television and movie acting, record producing, book writing, various business ventures, social advocacy, and philanthropy. Her many accomplishments have been recognized with numerous awards and other honors, including induction into the Country Music Hall of Fame. Dolly Rebecca Parton was born on January 19, 1946, in Sevier County in eastern Tennessee. Her father, Robert, was a farmer and construction worker. He and his wife, Avie, had a total of 12 children. The family was “dirt poor,” in Dolly’s words, and she and her siblings were raised in a rustic one-room cabin in the tiny rural town of Locust Ridge in the Great Smoky Mountains. She began singing as a young girl in a church where her grandfather was a pastor. With the help and encouragement of her musician uncle, Bill Owens, she also sang on local radio and television shows as a child. When she was 13 years old, she made her first record, titled “Puppy Love,” for a small label called Goldband, leading to an appearance on the Grand Ole Opry. The day after her high school graduation in 1964, Dolly moved to Nashville to pursue her music ambitions. She was soon hired as a songwriter by Combine Publishing, and a number of her songs, written with her Uncle Bill, were recorded by such artists as Skeeter Davis and Kitty Wells. As she was launching her career in 1966, she married an asphalt-paving contractor named Carl Dean, who she met in a Nashville laundromat. The couple would remain married through all of Dolly’s career, though Dean has always kept a virtually invisible public profile. Dolly Parton alongside Porter Wagoner on the set of the Porter Wagoner TV show. Parton’s first album, Hello, I’m Dolly, was released by Monument Records in 1967, yielding a couple minor hits. 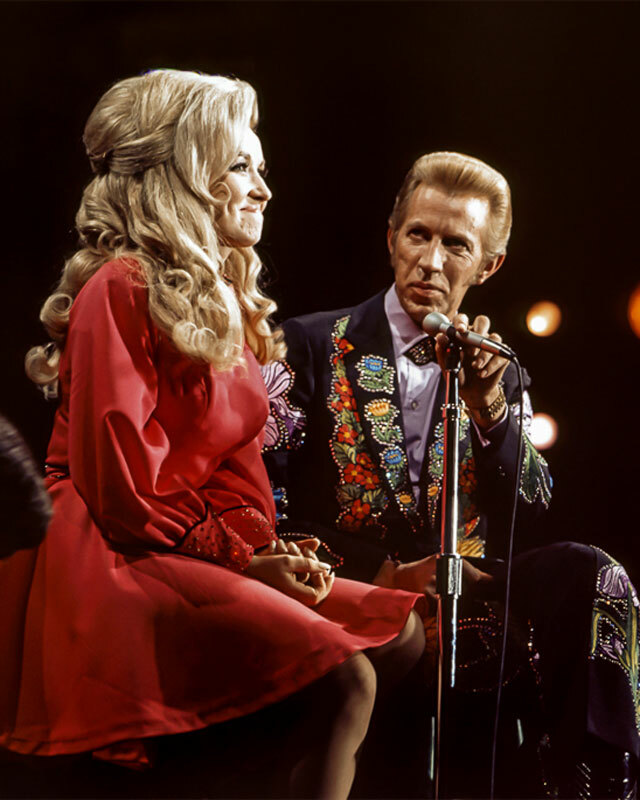 Her first major break occurred that same year when Porter Wagoner hired her as a regular performer on his popular television and touring shows. Wagoner persuaded his label, RCA Victor, to sign Parton. In 1968, a duet by the two singers, “The Last Thing on My Mind,” became Parton’s first top-10 hit. Porter and Dolly would have much additional success with their duets until Dolly left his organization in 1974. Watch Dolly performing “Love is Like a Butterfly” around 1974. Watch Dolly singing “It’s All Wrong, But It’s All Right” in 1978 on the POP Goes the Country TV show. 1980 was Parton’s best year yet, with three consecutive number-one country hits: “Starting Over Again,” “Old Flames Can’t Hold a Candle to You,” and “9 to 5.” The latter song, which also reached number-one on the pop charts, was the theme from Parton’s big-screen movie debut of the same title. The 9 to 5 film was a comedy starring her, Jane Fonda, and Lily Tomlin as office workers fighting their male boss’s sexism. This hit movie—coming after a series of television specials featuring Parton—greatly expanded her popularity, turning her into a pop-culture phenomenon. Video of Dolly’s “9 to 5” with scenes from the 1980 movie. Dolly Parton and Kenny Rogers singing their great hit song, “Islands in the Stream” at the CMA awards in Nashville, TN. Parton’s second movie role was as the madam of a brothel in The Best Little Whorehouse in Texas, a 1982 movie also starring Burt Reynolds and Dom DeLuise. She won praise for that role, as well as for her performance in Steel Magnolias, a 1989 comedy-drama about a group of female friends (who also included Sally Field, Shirley MacLaine, and Julia Roberts) and for her portrayal of a radio talk-show host in Straight Talk, a 1992 comedy. Parton has since appeared in numerous additional movies and TV shows. In her music during the 1980s, Parton charted a series of duet hits with Kenny Rogers, including “Islands in the Stream” and “Real Love.”. She found success in 1987 with an album collaboration titled Trio, recorded with her friends Emmylou Harris and Linda Ronstadt. The three friends released two follow-up albums, in 1999 and 2016. Dolly and Kenny Rogers performing “Islands in the Stream” in 1983. Dolly, Emmylou Harris, and Linda Ronstadt performing Neil Young’s “After the Goldrush” from 1999’s Trio II album. During the 1990s, Parton recorded a number of other musical collaborations, including with Loretta Lynn, Tammy Wynette, Vince Gill, Ricky Van Shelton, and James Ingram. She had her first dance singles hit in 1997 when a remixed version of her rendition of Cat Stevens’ “Peace Train” broke onto that chart. In 1999, Parton returned to her Tennessee mountain roots with a bluegrass album titled The Grass Is Blue. In 2005, her album Those Were The Days highlighted several classic folk-rock songs. In 2008, she wrote the score for a musical stage adaptation of the movie 9 to 5. The score included the song “Backwoods Barbie,” which was also the title of an album that year. Dolly singing Cat Steven’s “Peace Train” in the 1997 Junior Vasquez dance club remix. Dolly and Kesha singing “Old Flames Can’t Hold a Candle to You” from Kesha’s 2017 album Rainbow. Parton has also written a number of books, including a children’s book, originally published in 1994, titled after her classic song “Coat of Many Colors.” The well-received book was republished in 2016 by Penguin Young Readers Group with new illustrations by Brooke Boynton-Hughes. This story of a poor little girl, based on her own childhood, was aired as a television movie in 2015. Parton’s book Dream More: Celebrate the Dreamer in You, published in 2012 by G. P. Putnam’s Sons, was based on an inspirational commencement speech that she gave at the University of Tennessee in 2009. Parton’s autobiography, Dolly: My Life and Other Unfinished Business, was released by HarperCollins in 1994. In addition to her many artistic projects, Parton has long been involved with a variety of other business and philanthropic endeavors. In 1986, she opened the Dollywood amusement park at the site of a previous attraction called Rebel Railroad, in the area of eastern Tennessee where she grew up. 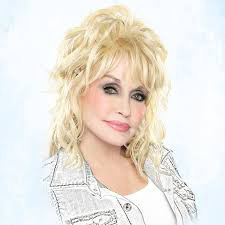 Her non-profit Dollywood Foundation, established in 1988, supports a range of causes for the people of eastern Tennessee, such as childhood literacy, jobs and healthcare, and natural-disaster recovery. From the foundation’s My People Fund, at least $3 million was used in 2016 and 2017 to help residents of this region recover and rebuild from devastating wildfires. Other business projects of Parton include the Dixie Stampede dinner theaters in Branson, Missouri, and Pigeon Forge, Tennessee, and a movie and television production company. Dolly discussing her gay fans and minority-related issues with Larry King in 2012. Parton is generally considered to be the most honored woman in the history of country music. She has won several CMA Awards and Academy of Country Music Awards. Her Grammy Awards include a Lifetime Achievement Award in 2011. She has had several nominations for Academy, Emmy, Tony, and Golden Globe Awards. Parton was elected into the Country Music Hall of Fame in 1999 and the National Academy of Popular Music’s Songwriter’s Hall of Fame in 2001. In 2004, she was presented with the Library of Congress’s Living Legend Award. In 2006, she received the National Medal of Arts, and her lifetime achievements were recognized with the Kennedy Center Honors. In 2016, Parton was honored with a special tribute during the CMA Awards program, including being presented with the Willie Nelson Lifetime Achievement Award. If you would like to learn more about Dolly Parton and her great career, I’ve included the following sources that will help get you started. Dolly Parton’s Facebook Page, Dolly’s Twitter page, Biography from Country Music Hall of Fame. See these sites for a listing of her song credits as well as her film career.